Large carnivores have always interested humans. Their large size and noticeable presence have both caused concern and sparked our interest. They are social and warm-blooded mammals, just like us, if only a bit hairier. They compete for the same food sources as us and they can be a potential threat to humans. For these reasons we both love and hate large carnivores and like to assign mythical qualities to them. We tell fables about them, use them in our metaphors and name things, objects and even sports teams after them. The wolf is a sizeable wild animal and large carnivore and you should remain calm and fearless when coming face to face with one. A rabid wolf or a wolf that is put on the defensive may harm a human, but this has not happened in Finland since the late 19th century. Finland has long experience in conserving large carnivores and managing their populations, and indeed there is wide interest abroad in the Finnish policy on large carnivores. This is why the Finnish suurpedot.fi website is now also available in English at largecarnivores.fi. This allows us to give information and take part in the exchange of information and views on large carnivores across Europe. 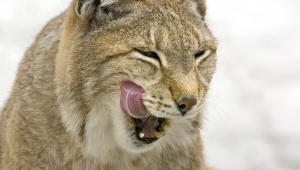 Largecarnivores.fi website offers a lot of information on the four large carnivores in Finland: wolf, bear, lynx and wolverine. Besides the highly popular details on the species and their tracks there is information on the conservation and management of large carnivores and their position in society. “We wish to tell about the varying interests relating to large carnivores from the perspective of management, conservation or, for example, reindeer husbandry,” says Sami Niemi, Ministerial Adviser at the Finnish Ministry of Agriculture and Forestry. The English language website is an information window on large carnivores in Finland for the international media, NGOs and all those interests in the matter. The website is maintained by the Finnish Ministry of Agriculture and Forestry, Metsähallitus, the Finnish Wildlife Agency, the Natural Resources Institute Finland and the Ministry of the Environment. Take part in game animal research! Occasionally large carnivores cause damages to domestic animals. Livestock and hunting dogs are the most common targets. However, a significant portion of large carnivore damages may be avoided with the right kind of preventive measures. Blog, professor Ilpo Kojola: Is there a predator pit in Karelia? Large carnivore populations are increasing in numbers and spreading to new areas in Europe, thanks to the conservation measures that have been taken. This has aroused considerable interest in large carnivores but also given rise to some concern and public debate. Already half of the measures defined in the 2015 Wolf Management Plan have already been realized. These measures have focused on the wolves, information sharing and acquisition, and the locals’ opportunities regarding their participation in the improvement of their area’s wolf population management. When you are travelling in nature you might be following a bear's path, quite literally. But can you tell the tracks of a wolf apart from tracks left by a dog? And do you know where you should report your large carnivore sightings? Do you know what to do if you meet a bear in the woods? You would really like to go berry picking or mushroom hunting in the woods, but is it safe? In general, large carnivores try to stay away from humans, but in some exceptional cases you might find yourself face to face with a bear. Here is some advice from a wildlife expert on how you should act. If you come across a large carnivore, the best thing to do is to keep calm. Retreating the same way you came is also often the wisest option. 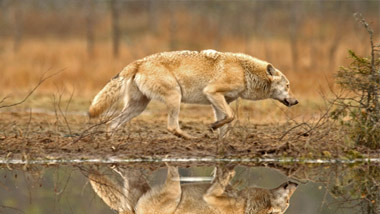 Sightings are important in estimating the number of large carnivores. You should give a detailed report of your sighting including precise location information to the local large carnivore contact person. Who is responsible for large carnivores?